Besant Technologies is a pioneering IT training institute that offers the Best Core Java training in Pune. We boast of our knowledgeable trainers whom we fondly call our asset. They impart lessons in a unique way putting all of their theoretical and practical knowledge into use. These expert professionals have gained part of their knowledge from their hands-on experience of working with MNCs, handling projects based on the Core Java technology and related areas. The best thing about the way we impart Core Java Training in Pune is that it is in sync with industry standards and needs. To be specific, our offered services include Core Java Corporate Training services, Core Java Online Training as well as Core Java in Classroom training. The designing of our syllabus has been done in such a manner that all real-world requirements are efficiently met. The syllabus we offer is not just suited to advanced level students but also beginners. An important aspect of the training we provide is that it is offered on weekdays as well as weekends for the convenience of students, according to their demands. Our aim has always been on providing One-to-One Core Java Training in Pune to make sure the trainees extract as much from the course as possible. And since we offer Core Java Training in Pune on a fast-track basis, time never surfaces as a problem. The instructors focus on imparting A-class training supported by a lot of practical examples. Besant Technologies has many branches in Pune. 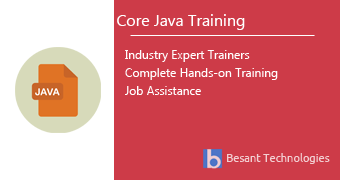 Besant imparts the Best Core Java Training Courses in Pune’s Aundh and Kharadi. Our past students and those who know about us render us the Best Core Java Training Institute, which has been making people’s career brighter by imparting Certification-Oriented Core Java Training in Pune. The training we offer for Core Java Certification in Pune is seamless for sure, considering the amount of expertise our faculties hold. With the completion of the course we provide, you will feel knowledgeable and confident to face all sorts of IT interviews. The association between the students and trainers at our coaching centres is worth taking a note of. It’s strong and friendly, and the students can engage in course related discussions as and when they feel the need. The trainees can be sure that they will get future assistance too from their trainers. Although there are many benefits of enrolling yourself with Besant, the biggest benefit lies in the placement assistance you receive. Our dedicated HR cell helps students find jobs of their dreams. Our aim is to provide quality training at affordable prices, because of which the Core Java Training in Pune Course Fees we charge is pretty reasonable. We are the sole Core Java training institute which is capable of providing video reviews of our former students so that you can learn from them about the institute. You will be surprised to know how many different job-positions you can choose from, after the successful completion of the Core Java course. Here are the major topics we cover under this Core Java course Syllabus Basics of Java, OOPS Concepts, String Handling, Exception Handling, Nested Classes, Multithreading, Synchronization, Input and output, Serialization, AWT and EventHandling, Swing, LayoutManagers, Applet, Collection, JDBC and Java New Features. Here are the Core Java Training Classes in Pune Schedule in our branches. If this schedule doesn't match please let us know. We will try to arrange appropriate timings based on your interest. Our Besant Technologies Pune Reviews are listed here. Reviews of our students who completed their training with us and left their reviews in public portals and our primary website of Besant Technologies & Video Reviews. I always knew a good training in Core Java could boost my career by several notches. But I was not being able to buy the claims IT training institutes were making in the ads. I always felt apprehensive of joining any random IT training centre. But then I had to choose one, so I chose Besant. I won’t say it was a well-thought out decision. I didn’t choose Besant because I knew a lot about it. Things just happened in a flow; I just happened to choose Besant. But I can confidently say now that I made the best decision of my life by joining Besant. My concepts in Core Java are crystal clear, and now I feel extremely confident to face any interview. How many times has it so happened that you just hear something from someone, end up trusting them and regret later? Well, for me, I have always believed in other people, and ended up being taken advantage of. And that is why when my friend suggested me to join the Core Java course at Besant, I was a little doubtful about how things would turn out to be. But surprisingly, I didn’t face any problem this time. In fact, I am grateful, I listened to my friend. Besant has changed my life. I am working at a reputed MNC today and I think I owe everything to Besant. I wanted to take up a Core Java course because my senior had told me its probable benefits in my career. But because I didn’t know much about the city of Pune, I didn’t know which the best coaching centre for a course in Core Java was. My senior recommended I joined Besant Technologies, so, I did! I am happy about the growth I have made post this training. And there is nothing about my job that I am unhappy about. I am in a good position and I feel I can go places with my Core Java certification earned from Besant. Most popular locations where students / professionals are lining up to get trained with us.